Description: The M.P.E. SC2000 is a Modbus SCADA-ready pump controller designed to perform level control in a wide range of lift station applications. The SC2000 operates the pumps based on the selected setup values and the wet well level signal. The level input source is menu selectable for either a 4-20 mA pressure transducer or a conductance probe. The SC2000 alternates the pumps, performs lag pump delays, and provides high and low level alarms. The SC2000 has a variety of control options available in the setup menu for customizing the controller for a specific application. 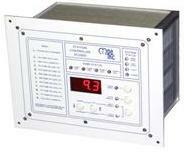 Optional I/O is available for VFD speed control and for additional telemetry inputs. The controller can be ordered with up to four additional analog inputs and up to four additional analog outputs.